It's really fashionable to be concerned about the enviornment these days. You have probably heard the term 'sustainable living' but for all its hype and fancy sustainability isn't all that complicated. Sustainability is our capacity to endure. Sustainable practices are those that combine environmental, social and ecomonic considerations to achieve lasting wellbeing for all of us. So we may be concerned about the environment and ourselves but a sustainable solution is one that works, one that we can afford and one that promotes the health of you, me, our immediate envirnoment and the world. 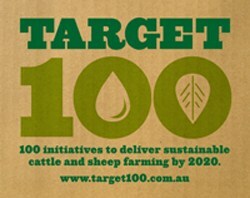 Target 100 is an iniative by and for Australian farmers to adopt sustainable farming practices. The discussion that is happening now because of Target 100 is an interesting one. The bigger picture is obviosuly for farmers and supporting organisations to work together to formulate and promote sustainability but you can be involved. Sustainable solutions are not about costing you money or creating upheaval. They are about being thoughtful, considerate and community-minded. Although the term was never used and the motivation was probably more financial, I grew up in a sustainable envirnoment - nothing was wasted, things were in their simplest form and we worked with the environment rather than against it. I'm grateful for that. If you are interested head to the website here or do a bit of a search on Twitter using the #wastenot for sustainable ideas you might find interesting, economical and helpful. mmmmm coconut mango popsicles. happy Aussie Day! what can i do with my extra herbs? salsa verde! Chocolate cheesecake - sugar = happy campers!